Tom Stoppard's classic wit doesn't fail to entertain in this revival over 50 years later. Think of your favourite book or film; then change the perspective of the story to that of the minor characters. That’s the premise of Tom Stoppard’s famous play, Rosencrantz & Guildenstern Are Dead, which puts a new spin on Hamlet from the point of view of the Prince of Denmark’s dear friends. It premiered in 1966, but has seen a recent revival at the Old Vic in London starring Daniel Radcliffe and Joshua McGuire in the title roles. 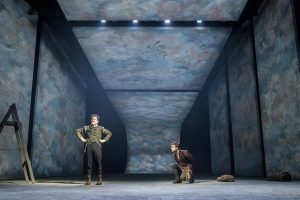 The production has received great critical acclaim, and it is easy to see why the National Theatre decided to broadcast the performance live to cinemas nationwide as part of its NT Live scheme. The first thing that struck when the curtain lifted was the set. The Old Vic stage had been pushed as far into the audience and taken as far backstage as possible, it seemed. With the set extending back as far as it did, the upstage portion could have been used even more, as most of the action took place downstage. This being said, the dreamy blue, cloudy backdrop made for an interesting image of two men stranded in a story bigger than they are. In fact, Radcliffe and McGuire’s casting was in a similar vein – as men of a shorter stature, whenever anyone else in the cast was on stage, they appeared noticeably taller; this was a smart move in making the pair look even more insignificant. For this is the central theme of Stoppard’s masterpiece: Rosencrantz and Guildenstern, as minor characters in Hamlet, spend the majority of the play questioning their very identities and how they came to be in the situation they find themselves in within the story. Radcliffe and McGuire were marvellous as leads. They are clearly both very intelligent men (you have to be to carry one of Stoppard’s plays), and their fast repartee which conveys Stoppard’s wit was very well done, albeit a little hard to follow at times. With this play, there is no time to zone out even for a second! Considering the majority of the play consists of the two on stage experiencing something of an existential crisis, the two must be applauded on the brilliant job they did, as it would have been incredibly easy to lose the audience’s attention and interest in these moments; yet the audiences in both theatre and cinema were engaged and laughing throughout. David Haig must also be commended on his performance as The Player –a mysterious, almost ethereal character and the leader of a troupe of actors. He seemed to be the only character who understood that Hamlet and the events transpiring around them were not real life but a play. Haig made an eccentric Player to say the least, with a shaggy, dishevelled appearance and a flair for the dramatic and flamboyant. His larger-than-life presence was, for me personally, sometimes a bit over the top, but overall his portrayal worked well. As the leader of his troupe, and this higher knowledge about the action which Rosencrantz and Guildenstern do not have, he was shown to be a puppet-master figure with the power to manipulate events, which worked well in the context of the play on the whole and further brought into question the character’s role and his true intentions. This revival of Stoppard’s work can only be described as a success, still drawing in audiences more than 50 years later. With strong performances from the cast and an innovative set design to pass off the sharp scene changes, the play was still just as entertaining to watch as when it first premiered. Just be sure to do your research on both Hamlet and Stoppard before you see it! 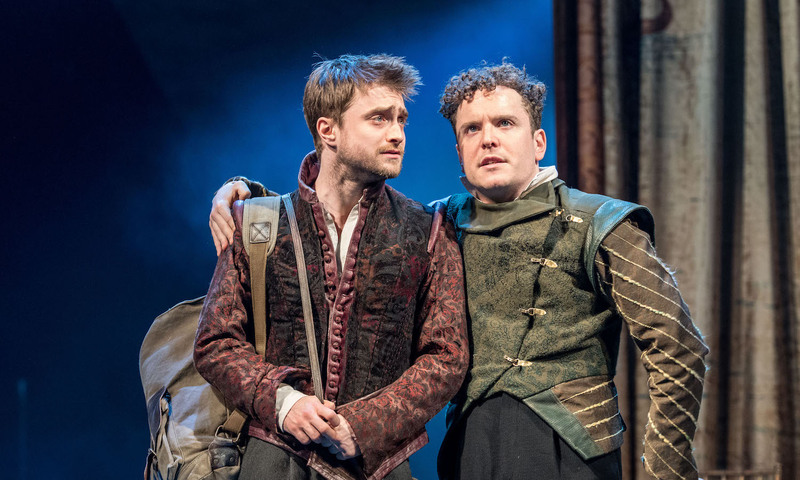 Rosencrantz & Guildenstern Are Dead played at the Old Vic until the 6 May, and was broadcast to cinemas on the 20 April. Encore screenings are being held at select cinemas later this year.